BIG BLUE WAVE: Could Anthropology Help the Pro-Life Movement? Could Anthropology Help the Pro-Life Movement? Consider this post a discussion starter. And yes, it's wordy. For decades now, pro-lifers have been arguing for the humanity of the unborn both from a theological and a philosophical perspective. And I think we have done a very good job. You can't argue theology and philosphy with minds like that. And while it's desirable to try to convert them to the idea of truth and objective reality, it's a very difficult task considering that they have abandoned the very thing that will get them to reject their subjectivism: which is to say logic. I think anthropology could be another approach that the pro-life movement could use to go beyond this rationalist discourse. I'm saying that we should abandon our theology and philosophy. I just think we need to add to it. We need to reach people at another level. Pro-lifers do attempt a bit of anthropological thinking when we compare the denial of humanity to the unborn to other instances in history when other groups have been denied their humanity: women, Jews, blacks and so forth. The thing is, if you're not working with the same concept of human being, it doesn't matter if you point to those instances, your audience will not be convinced. I propose that by exploring the idea of "what is a human being" and "what is a person" we can convince them to accept the humanity of the unborn. A blogpost is too short a space to explore this subject in depth. But I'd like to put forward my (very amateur) anthropological observations about how people attribute personhood in this culture. Given our culture's near total abandon of the notion of objective truth and reality, and its extreme emphasis on the subjective, you could practically say that a human being is an experience. That might sound weird, but let me explain. A human being's existence is not something objective. We can say "life begins at conception" until we're blue in the face and for a lot of people, it doesn't matter. Facts don't matter. Feelings (and thus experiences) matter. Facts, thoughts, logic, deductions, conclusions, all that "thought" stuff that doesn't matter a lot in this culture when it comes to values. People strongly distrust their own ability to think and especially mankind's ability to think. It even undermines our trust in our own sense-perception. People think that you can't even be sure what you're seeing is really what you're seeing. I know believers see a lot of scientism in opposition to their faith, and so they think that people are empiricists, but those aer few and far between. What people trust is their feelings. If you feel something, that's true. If you experience something that's your "truth". Something that is true is something that is able to make you feel. A human being is able to make you feel. He can feel, and his feelings make you feel, and that's how he's an experience. His ability to make you feel something is mediated by the face. A face is what makes observers feel. His ability to communicate and thus make one feel, and thus experience, is what makes him a human being. And if a homo sapiens has a face, but cannot make one feel: for instance, if he's in a vegetative state (as it is commonly understood), he's no longer a person. He's a pile of flesh. This explains why our culture is more ready to consider granting personhood to late-term babies and primates than to faceless embryos. Primates feel and make others feel, faceless embryos don't. They're a ball of cells. I don't wish to propose that my observations are scientific truth. But for the sake of argument, what if they are? I raise this point not so much to propose a course of action (although I think mine is perfectly plausible) but as an exercise to show how anthropological thinking could maybe help us think outside of the box. Now we could try to argue with such people that they're wrong, propose facts and arguments as to why they should believe in objective truth and therefore the humanity of the unborn, but that would inefficient and incredibly difficult. What we would need to do is operate within the framework of making the unborn an experience. Now, there is the danger that by operating outside of objective truth, we ourselves descend into subjectivism and modernism. But just because something is experienced doesn't make it contrary to reality. What I think might work to make the unborn into an experience is a form of vicarious experience through art. The ultrasound was revolutionary for pro-lifers because it finally lifted the veil (somewhat) over the unborn, and it made it possible to experience the unborn. 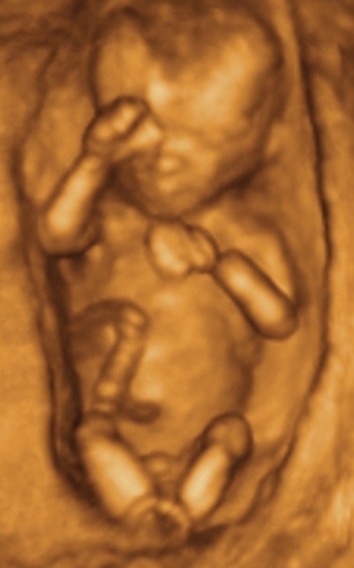 But these unborn are usually at least ten, twelve weeks old. A six-week embryo looks like a bean. Somehow we have to create cultural expression so that the people can metaphorically experience the unborn. I realize that, to people used to rational discourses, that doesn't sound like it makes any sense. But we're not working with rationality. We're working around it. Art and poetry and other cultural products are metaphorical and because of them they are experiences. And the nice thing is that you can make them any kind of experience you want. These things can make people feel about embryos the way we do. We have to eliminate the face as the necessary factor in the linking of emotion to humanity. We have to make people feel humanity exists even if there is no face. Now my observations and possible course of action may or may not be true. The point is that we need to go beyond the categories of true/false right/wrong good/evil. We shouldn't abandon them, but we have to go beyond them. Ultimately what we want is for others to adopt our mental representation of the human being-- we know it to be right, but whether they adopt it through a logical deduction or through an emotional attachment we create, that make no difference-- we need for them to adopt it. I think anthropological reasoning and knowledge could maybe shake up the abortion debate. It does get stale and people stop listening because they've heard all the arguments before. If they hear something new that makes them feel differently (especially if it's positive), they're more likely to pay attention.